CodeIgniter is becoming very popular due to its reliability and ability to make an application . Moreover with CodeIgniter development of an application to be easy . Included is create a login system which is an essential element of an application . This tutorial explains how to create a login system using CodeIgniter and make multilevel login with CodeIgniter . Hopefully Helpful . The most important libraries in the login process is SESSION . Actually PHP already provides a function to perform SESSION, Database and Form Validation process , but the Framework has been ” wrapped ” become easier to use and a lot of features that we can use . At CodeIgniter Framework there is also a library that can properly manage the Session SESSION Class, Form Validation Class and Manage Database database Class . With this Classes you will be facilitated in managing SESSION, Database and Form Validation of users accessing your application . In the user guide / documentation of CodeIgniter already explained very clearly in the Session, Form Validation And Database Class . To view or you can simply call the Session and Database Class From Your CodeIgniter Project/Application/config/autoload.php in line number 55 . Yes, the above is a way to call Session Class that we will need later. Now you must set session encryption Key in CodeIgniter Project/Application/config/config.php in line number 227 . And Also You Can Set your Database information in CodeIgniter Project/Application/config/database.php in line number 51 – 65 . Session that we have set will do the “maintenance” of the user who is using the session. And it is certainly the session expiry now got in CodeIgniter already has features to set the age of the session. How??? you simply open the config.php file. If you do not know me you know you get to the directory Your CodeIgniter Project/application /config / config.php. Okay the above code snippet is how we are going to check , whether the session is already in use or not . If no alias is not activated by the user or used by the user application ( marked with ! Exclamation point ) then will be directed to login page . And vice versa will be directed to the home page . Less like that later on the workings of belonging CodeIgniter Session library . We’ll start by creating a login system and the second is to create a multi-level login system alias each level can be adjusted to the level of the login user user alias . Once we make a how to make a login system with CodeIgniter, this time we will move to a more complex system than the system log, namely Multi-level login. Okay we start with preparation beforehand. Yes, preparation is that we shall devise in advance what we will create later in the system log. 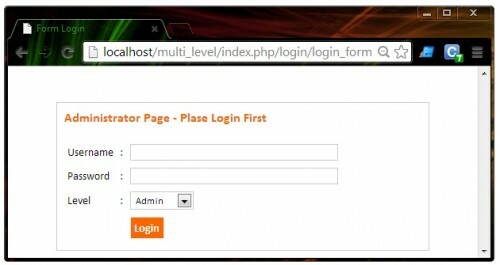 We will create a design that is suppose we have two levels of login, the Admin and Operator. Where if one login then will be directed to a specific page. How have understood his right design? Next do mofikasi the login controller. Here we will add a session to the level. And later on this level is the reference to distinguish among users. yes that’s the addition of a new script as a “weapon” to create multilevel login. Now Modify the file home.php in your views. Here we will change the display according to the level of the user. Okay the point is that we can distinguish the user level by setting the session that you created earlier. So, you can make modifications through the level that we set through the Controller. Multi-level and make you make far better meet the needs of your application. nice tutorial for novice and intermediate codeigniter programmers…….tnx……. Nice job. Really love this source code. For some reason I cannot log in even after creating a user and password. What’s new style for dropdown menu then??? What’s the new style for dropdown menu then???? Hi. Thank you for your tutorial. It is of great help to me. Whoever, i have a problem with the first login script. it cant log in. It instead transfers my password to the username field and and provides an error message at the password field. Can you help please. Download link no longer available. i copied the code exactly using username as Omran and password as 123456 but it seems as The Password field is required..
it’s a really nice tutorial. But it’s the way that we asked users to logged in as a member. I think it should work behind the code not visible on the login system if the level is 1 then admin dashboard should open and so on so forth.